The total eclipse that crossed the USA on Monday, August 21, 2017 has come and gone. We in the Seattle area who did not adventure to Oregon’s total eclipse zone would experience a 92% eclipse. We were pretty excited but had no real idea what would happen. Reflecting on Monday, I have to say the best part of the whole experience was the social togetherness. We all embraced a common moment in time to view something that was not man-made but rather a rare treat of our beautiful planet. Many will say it was a glimpse of a greater being or the joy of coming together in a way many of us had not expected. We traded our electronics for a gathering with our non-technology paper glasses. We should all reflect back to that moment and how to replicate it in the future. It would get dark like dusk and become an early twilight. The stars would be visible – this is a phenomena seen at the total eclipse so why not at 92%? After you get done laughing about the zombies, here is what really happened. Twilight was not to be. At the maximum point the sun was 92% covered and it looked like a crescent moon. Even with only that tiny bit of sun exposed it never got dark. However, the light was not right. It was bright but in a murky muted way. It was like the spectrum of light was diluted but certainly not dark. The crow murder fly-in like an Alfred Hitchcock “The Birds” scenario was not to be. That odd light was not dark enough to spur them to a mass migration. Nor was the length of this natural phenomenon long enough for them to rally the troops. We did have one crow land on the edge of the warehouse. My friend Jeff alerted me to him acting a little befuddled. Was he really concerned about the odd sun thing or more interested in the snacks our warehouse crew were enjoying. 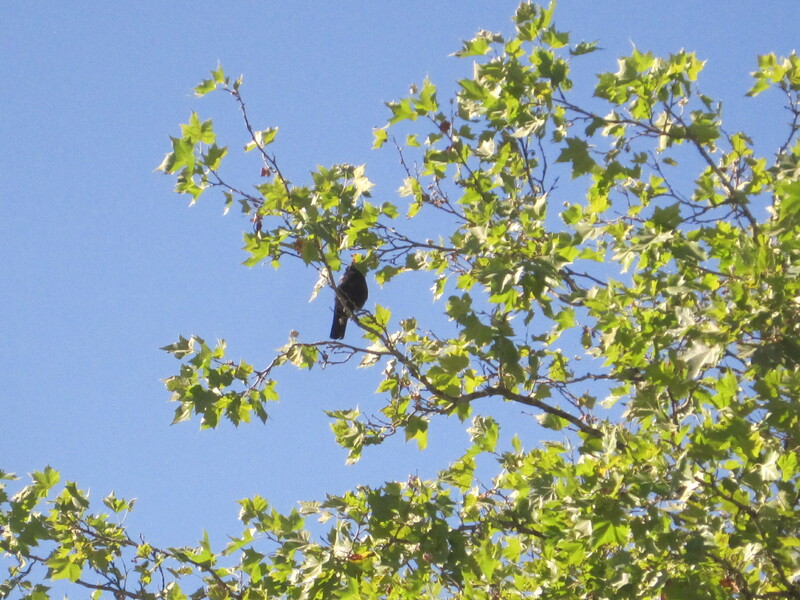 This lone crow flew into one of the trees and I snapped this photo. Notice how the leaves in the tree are reflecting the odd light. Again, not very scientific since this could just be another poor quality photo. Sorry everyone – no stars popped out in the morning sky. That muddy light was still bright, so there would be no star-gazing. However, we were all in awe of what the eclipse looked like when we looked through the one pair of solar eclipse glasses we had among us. Silence was not for us to experience either. If nature had gone quiet we would not know. Perhaps in the wild and closer to the total eclipse zone it got an eerie silence. 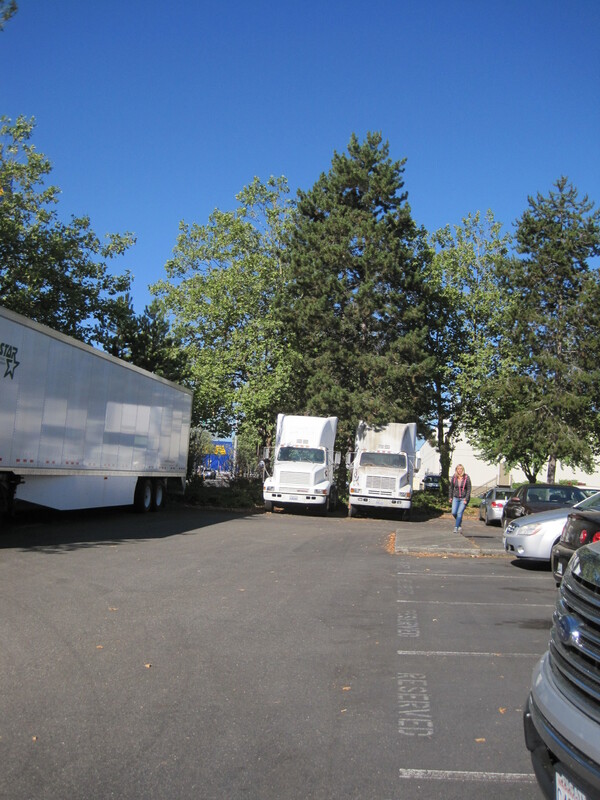 In Renton at our warehouse we are on a busy corner with traffic whizzing by. Plus a trucker who had delivered earlier had stayed parked in our lot. His engine was running the whole time. 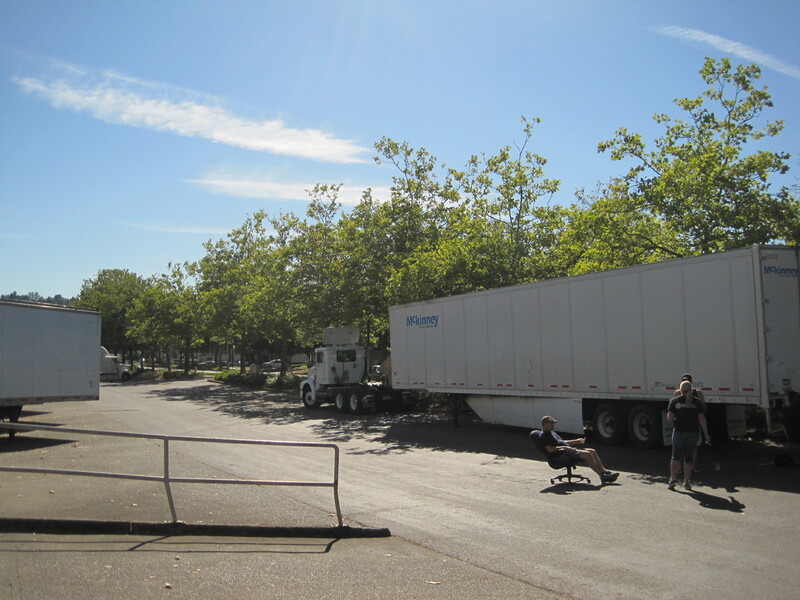 We talked about how someone had heard that truckers were advised to be parked at the time of the eclipse. The Washington State Patrol was telling people to not pull over and park on the side of the freeway nor stop in middle of the road. Eclipse fever could cause an accident. So, was that why the trucker was there? Probably not. When I went over and asked them if they wanted to look in the eclipse glasses we had a short chat. They were waiting for their dispatcher to tell them where the next load was to be picked up. Just a coincidence at work. The zombie apocalypse of course did not happen. However, right at the maximum time of 10:21 am a fire truck went rushing by sirens blaring. Someone had perhaps not listened to the WSP warning to pay attention to their driving. But then again perhaps there was a zombie attack down in Kent. Our imagination had run away from ourselves in this carnival like experience. What an experience of a lifetime. It was science, it was nature, but most of all a lesson of mankind’s need for each other. I had set it up a camera my office window to capture the potential of twilight forming. Reviewing the existing film, I found no special light nor did it record the human adventure happening in the parking lot. It had missed the true experience which happened outside with our fellow humans. Reminds me that technology is great but it is only a still life of the real force in us all. Stay alert everyone for that spark. It is not in the lens of the camera but rather in the lens of our lives.